Gasket tolerance dependant upon DIN ISO 3302-1. Soft rubber usually according to ‘E2’ and sponge rubber according to ‘E3’. PVC edge protection profile tolerance dependant upon DIN 16941-3B. The appropriate storage is important (optimal storage temperature +5°C to +20°C). For the storage of gaskets, attention should be paid to DIN 7716 (guidelines for storage, maintenance and cleaning of rubber products). If possible, wrong storage in respect to long lay days or storing times should be avoided, since the mechanical characteristics may change. The compression of our sealing profiles should be 50% max. since otherwise the function (tightness) and the resetting forces are affected. In practice, the profiles are compressed between 30-50%. 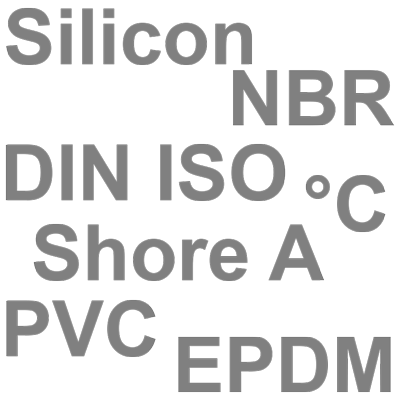 It does not matter, whether it is a EPDM, NBR or a silicone profile. Here, the mechanical properties are (unlike the chemical resistances) quite comparable. If the gasket is deformed beyond these limitations, there is the risk of the compression set (DVR) becoming too big because the material deforms plastically as well. Then the gasket would be designed too lean. Because of the large variety of possible chemicals, solvent (concentrations), operating temperatures and times, no evaluations concerning the possible resistances can be made at this point. In every individual case, a test in the present circumstances, like concentration, temperature and duration of the impact, is recommended. We supply materials certified according to the current fire protection standards for rail vehicles. E. g. according to DIN 5510-2; NF F 16-101/ -102; DIN EN 45545-2; UNI CEI 11170; ASTM-C and –E. Whether the achieved categories fit to the respective requirements or vehicle classes has to be verified for the individual case. Generally speaking you can achieve higher fire protection classes with silicone profiles than with EPDM. As a rule, disclosed values are standard values detected on sample plates and correspond to our state of knowledge. They do not, however, relieve the final user from their own thorough tests.